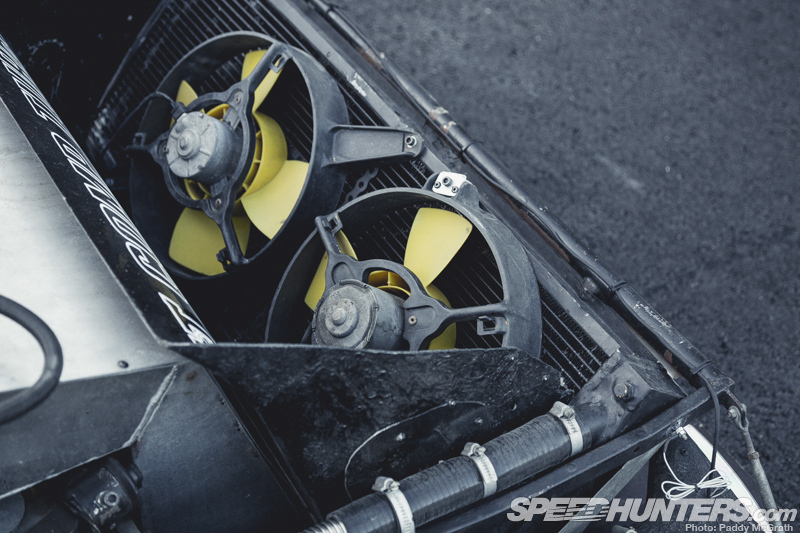 In the Speedhunters world the name KRB needs little introduction. 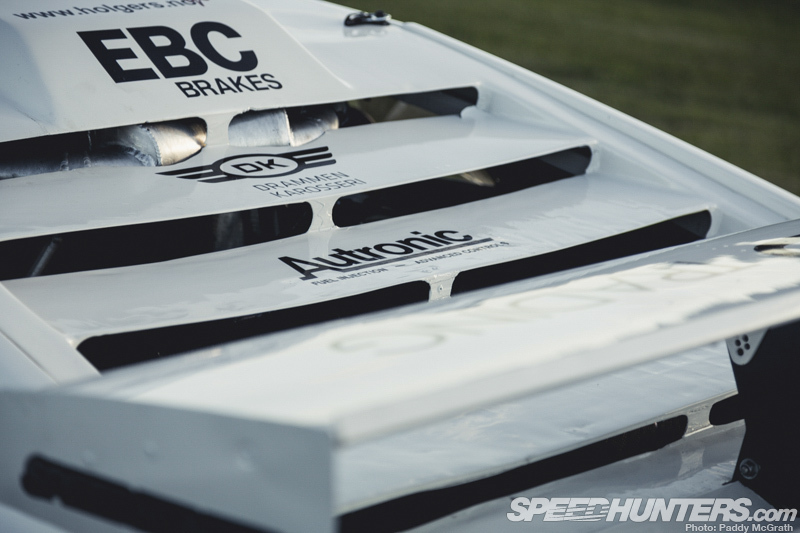 For the past couple of years, the automotive exploits of Norwegian car builder/race driver, Kai Bakken and his 1000+hp Group B-inspired Audi have gone a long way in putting the Scandanivan modified car scene on the map, so when KRB embarked on a new project late last year, we knew it would be something special. But in a break from Kai’s norm, the newest addition to the KRB family wasn’t a quattro-underpinned Audi capable of frying all four tyres at the same time, but a 1984 Tiga C2 Prototype race car bestowed with the looks of a Lotus Esprit on steroids. Earlier in the year Jonathan dropped by the KRB workshop to take a look at the work-in-progress and talk to Kai about how he came to be in possession of a slice of Scandinavian racing history. 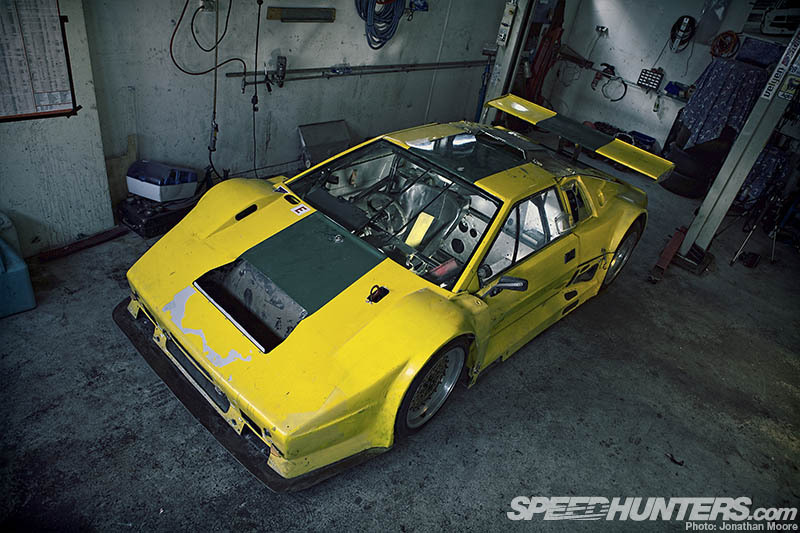 It’s an interesting story too, beginning with a Swedish Tiga employee purchasing a crashed chassis and rebuilding the car with lightweight Lotus silhouette-style body panels, and ending in a pile of parts after it was sold in 2008. But it’s the bit in the middle: the tenure in the Swedish GTR Championship during the late ’90s and later success in the Nordic Supercar Challenge, that sealed the deal for Kai. 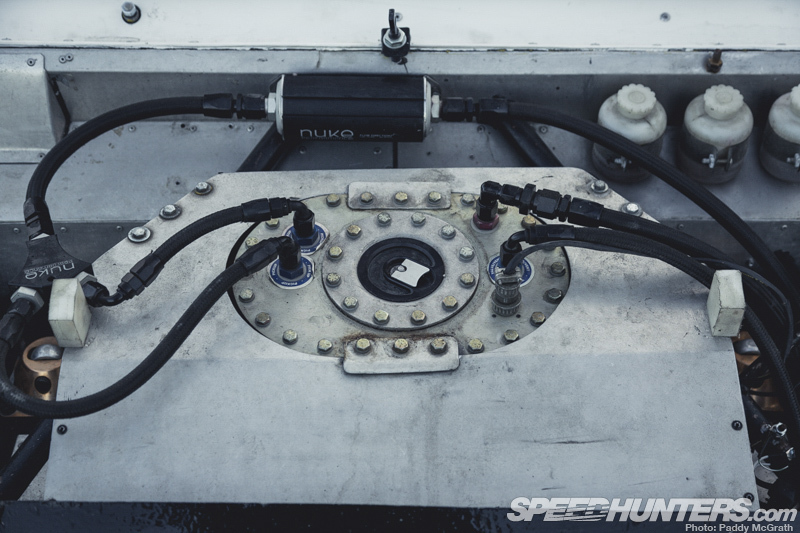 After years of following the Lotus for years he resigned himself to one day owning it, and although it didn’t happen right away, Kai’s perseverance ultimately paid off in October last year when he finally got to tow the partially stripped-down chassis home. The fact that the Lotus was in bits and devoid of its NASCAR-spec Chevy V8 engine was of little concern to Kai, because he had absolutely no intention of restoring the car to its original racing guise anyway. Instead, the idea was to continue its evolution by utilizing a little KRB DNA. Considering what he began with, the eight month turnaround from an unfinished project to a race-ready rebuild and possessing more potential than it’s ever had, is rather impressive. More so is the fact that it’s far from finished. Kai is using the Scandinavia’s summer racing season to test and develop the car, before making a full assault on the GT1 class of the Norwegian GT Championship in 2014. Like the Audi, the Lotus will also be used for Gatebil events, where it will run in the Extreme Time Attack class. ‘Extreme’ is a word that fits nicely here too, especially when you start delving below its lightweight fibreglass skin. Although much of the car remains in the same specification it was last raced in five years ago, KRB’s enhancements are plentiful. But in no place more so, than beneath the louvered rear deck. 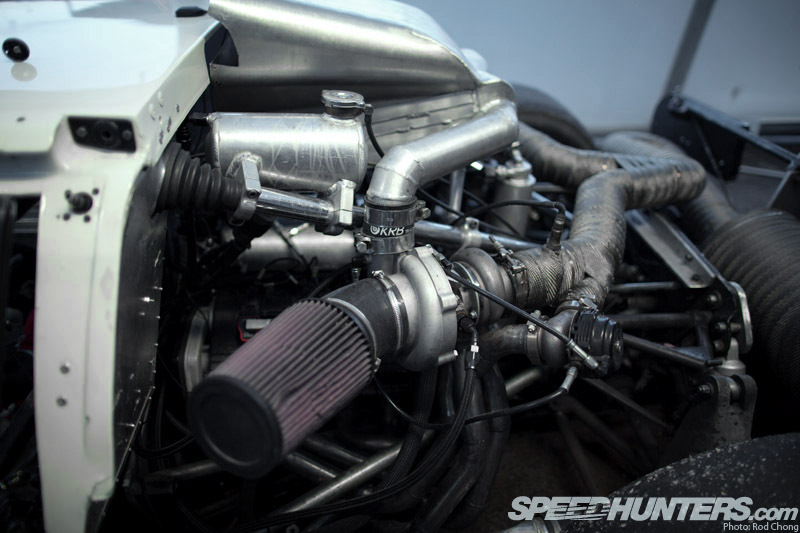 It’s hard to see through all the pipe work, but slotted deep into the chassis is a KRB-built, 4.2-litre quad cam Audi V8 that pushes 829 horsepower and a similar amount of Newton meter-measured torque to the rear wheels via a five-speed Hewland VG transaxle transmission. Although Audi’s quad cam V8 has the ability to generate decent numbers in naturally aspirated form, an atmo’ diet was never going to cut it – this is a KRB build after all. 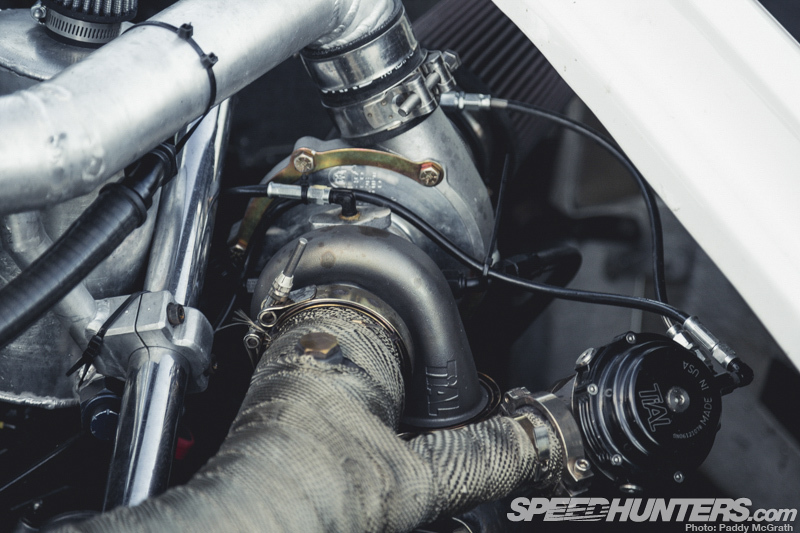 The set up runs two Comp Turbo turbochargers, complete with TiAL exhaust housings and dual wastegates from the same maker. According to Kai, just 1.2 bar (16.7psi) of boost pressure was needed to realize what is a seemingly an effortless 900hp at the crank. 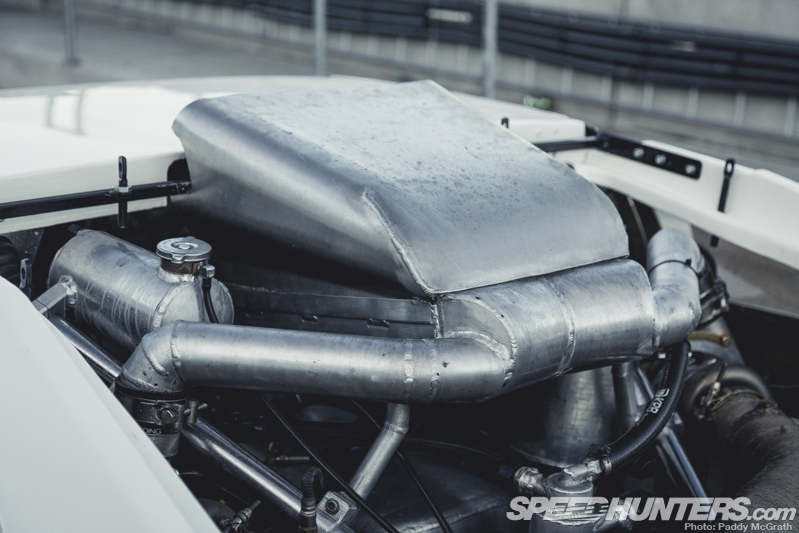 The custom KRB intercooler arrangement helps the cause too, drawing cool air from an alloy shroud that pokes its head just above the roofline. It’s perfect placement considering the engine’s ‘V’ configuration and the position of the turbos, for which only short pipes were required to complete the plumbing equation. Of course, the engine itself has been built right too, utilising CP forged pistons and KRB H-beam rods with the factory die-forged crank, and featuring fully race-prepped cylinder heads complete with upsized and uprated KRB valvetrains and KRB-spec cams. Fuel is still supplied from the car’s original front-mounted cell, but Nuke Performance ancillaries now feature throughout. Another component at the front of the car that’s been kept over from the last set-up is the large radiator arrangement, which only needed a clean and some new hoses to bring up to spec. 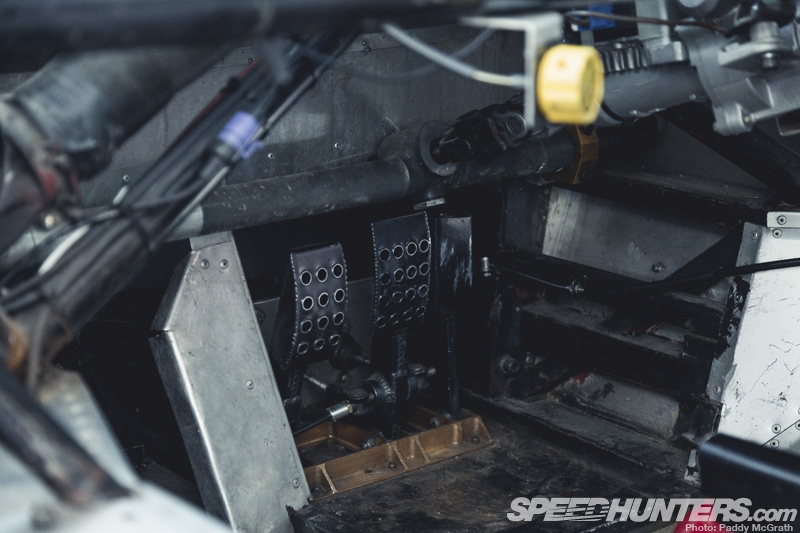 Along with the transaxle arrangement, the main chassis and suspension components have all been retained too. Given the way the car performed during its last year of competition, there was little need to make any radical changes here, especially given the quality gear used throughout. There are Öhlins coilover shocks in the mix, along with large Brembo brakes on all four corners. Originally rolling on BBS center-lock mesh wheels, the new BBS Y-spoke rims are a more modern addition however. At 18×11-inch at the front, and 18×13-inch, they’re suitably sized too. Keep that wheel diameter in mind when you look at this photo and you might start to understand how low-slung the Lotus actually is. The roofline extends to just 30cm above the rear wheel at 102cm (40 inches) tall, or around the same height as Kai’s waist when he’s standing next it. That then goes someway in explaining the reclined driving position in a seat that’s directly mounted to the framework of the floor. 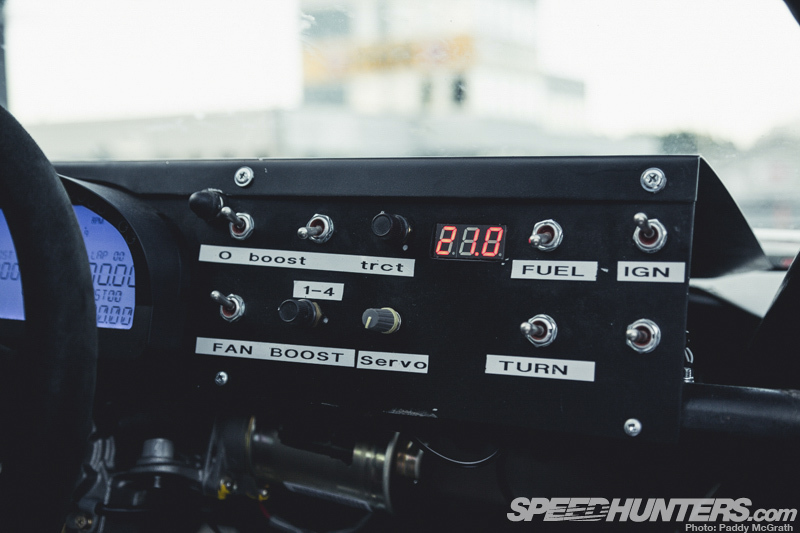 Somewhat less agricultural is the new dash arrangement, which features a RacePak digital display/data-logger, and a new switch panel complete with knobs and switches for all the important stuff, including boost pressure and traction control. I can’t decide whether this looks like a comfortable place to sit or not (note the small square of padding as a head rest), but I doubt it’s of any concern once the fuel and ignition switches are flicked, and the engine – just centimeters from the back of your head – is fired into life. That’s courtesy of the Autronic SM4 engine management system of course, which you can see mounted on the rearward firewall at the far side. There’s raw appeal here. This is a real race car. I’m not sure if Kai has any further plans for the industrial, almost military-like sheetmetal and rivet-clad interior, but given his function-trumping-form approach to engineering, I going to hazard a guess and say that he’s happy with it just the way it is. As I’m sure he is with the entire way the reincarnation of sorts has come together. Wild silhouette styling from a bygone era wrapped over a Group C spaceframe chassis and mated with a modern, high tech twin turbo engine. Does it get any better? No, I don’t think so. According to Kai the Lotus affords a totally different driving experience to the Audi. As you’d expect, high cornering speed and straight-line acceleration are two of its main attributes. But on the flipside, it lacks the traction of the S1’s quattro driveline, so throttle-mashing timing is absolutely critical. Right now the car has proven to be quicker than the Audi on the fast, open tracks, but slower on the lower speed ones – something that will be figured out in time with more seat time and subsequent chassis tuning. 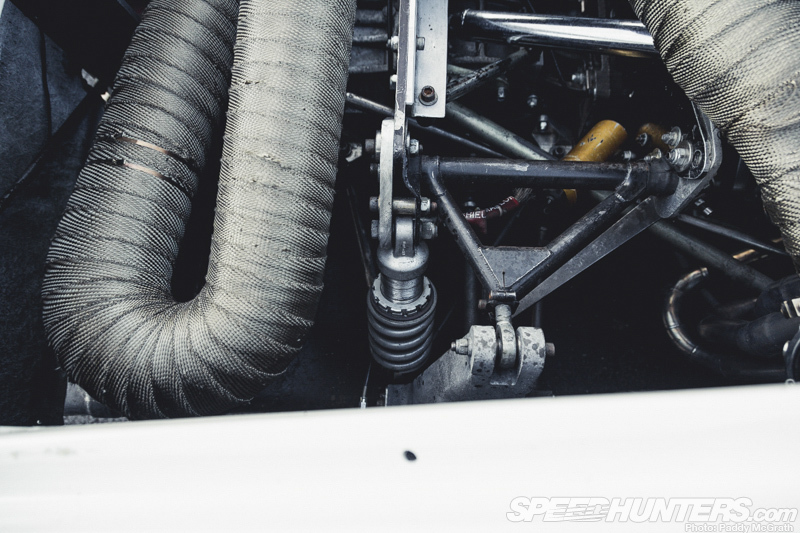 Overall though, thanks to a longer powerband that arrives much lower in the rev range, Kai believes the car is much easier to pilot now than it ever would have been with a peaky, naturally aspirated, big block V8 mid-mounted in the chassis. Well, as much as 829hp in a 1,050kg rear-wheel drive chassis affords anyway. Regardless of its drivability, or lack of, the Lotus has already shown plenty of promise, already having lapped quicker than the 2011 and 2012 championship-winning Porsche in two of three races Kai’s driven it in. That’s a pretty big achievement all things considered, let alone on its maiden test season in KRB guise. But really, we wouldn’t expect anything less from the brains behind one of the wildest Audis to ever roam the earth. And you can read about that car in detail, before our Scandinavian-themed month is out. Stay tuned! WHY WOULD YOU PAINT IT! IT WAS PERFECT BEFORE! PERFECT! :C It was so much racecar I couldnt handle it....Now its looks like a run of the mill Lotus racecar.